. High Definition. Supports converting HD videos (H.264/AVC, TS, AVCHD, MKV). Save time by converting in batches. Multi-core support means faster conversion.
. Customize Video Output. Crop video, apply artistic effects (Old Movie Effect, Black and White, etc), add subtitles/soundtracks/watermarks, merge files and add transitions, split video, adjust video file size, and much more!
. Convert Videos for Various Devices. Supports numerous devices such as iPod, iPad, iPhone, Apple TV, PSP, PS3, Xbox, Creative Devices and more. Run in the background without conflict or slowing down.
. High-Definition Video Converter. Supports a wide range of HD video formats, Xilisoft Video Converter allows you to convert between multiform HD formats such as H.264/MPEG-4 AVC, AVCHD Video (*.m2ts, *.mts), Apple TV h.264 720P, MKV, HD WMV, and MPEG2/MPEG-4 TS HD Video, as well as convert videos from HD to SD.
. Convert Videos with Super High Speed. Convert a video in an instant with multi-core CPU processing and set the number of cores for conversion to customize conversion speed.
. Video and Audio Conversion. Whether you are converting between multifarious video formats (such as AVI, MPEG, WMV, DivX, MP4, H.264/AVC, MKV, RM, MOV, XviD, 3GP, and FLV), audio formats (such as MP3, WMA, WAV, RA, M4A, AAC, AC3, MP2, and OGG), or extracting audio from a video, they can all be done in a matter of clicks.
. Transforming between Videos and Pictures. Produce a creative video from your favorite photos within minutes. Create a picture collection from your movies or fun videos as a souvenir/memento. View and enjoy them with your family and friends at your fingertips.
. Transfer Converted Video/Audio Files to Devices Directly. 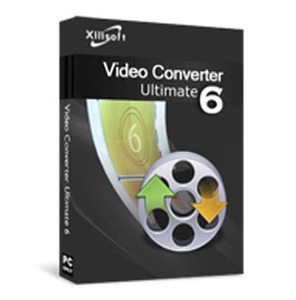 Convert and transfer video/audio files to iPod/iPhone/PSP in one quick step with Xilisoft Video Converter.
. Merge Several Files into One. Enjoy your video/audio/picture collections differently by merging several of them together; add transitions between every two videos/pictures for enhanced viewing.
. Clip Segments from Video. Clip your favorite sections of a video and merge them together to make the video you want.
. Split a Single File into Several. Is a file too large for your iPod, iPhone, PSP, or mobile phone? Simply split it into several files to make it fit onto your multimedia device exactly.
. Crop Frame Size to Retain What You Want. Crop the picture frame of a video to remove any unwanted areas from it using this video converter like a pair of smart scissors.
. Adjust Video Settings and Add Special Effects. Adjust video brightness/saturation/contrast. Add artistic effects such as old film, gray, oil painting or canvas to make your video look special.
. Add Watermarks to Video. Personalize your video with multiple picture and/or text watermarks added.
. Create Video with Subtitles. Add subtitles to your video and adjust their relative transparencies and positions.
. Create Video with Soundtrack. Dub your video with your own voice or any soundtrack you fancy.
. Optimized Conversion Profiles. Comes with optimized and classified conversion profiles for a wide range of multimedia devices. Customize an existing profile and saved it as your own.
. Rich Parameter Settings. Adjust general video, audio, picture and tag parameters such as start time, duration, video size, video/audio/picture quality, audio channel, split size, image capture interval, ID3 tag info and much more. More advanced parameters are available for professional users.
. Convert a File into Several Formats Simultaneously. Select a variety of output formats for a source, and let Xilisoft Video Converter do the rest.
. Determine Output File Size. Compute the output file size precisely with the aid of Xilisoft Video Converter's Bitrate Calculator.
. Video Preview. Preview the original and the edited files side-by-side for easy comparison.
. Convert Files in Batches. Xilisoft Video Converter can convert multiple files simultaneously with multi-threading and batch processing.
. Extra Conveniences. Automatically keeps your software updated with the latest features; multiple skins and language interfaces offered; run the application in the background to save CPU resources. Videos bearbeiten, schneiden, zusammenfügen und Wasserzeichen hinzufügen. ist zwar version 5...... aber geht alles genau so. Also Version 6.5 lässt sich wirklich mit nichts aktivieren, Version 5 läuft einwandfrei. dannn nehm version 5. ist das gleiche.